Till, betwixt both, I’m ready to expire! ’Tis then, great Soul, I think thee more than Man! Over the last four centuries, actors and directors are not the only figures who have brought Shakespeare’s work to life. Readers, too, conjure up scenes and characters in their mind’s eye, creating personal and powerful interpretations of the plays. Since the 17th century, readers have annotated their copies of Shakespeare. An anonymous reader of the 1685 Fourth Folio marked the table of contents, noting plays “read” and “acted.” It is unclear if the owner himself (or herself) acted in the plays or simply saw them performed. Given that there are no further notes within the book, this does not appear to be a copy marked up for performance. By the 19th century, advances in printing technologies, including color printing and publisher’s bindings, facilitated editions of Shakespeare aimed at specific groups of readers. Women read and wrote about Shakespeare in the 17th and 18th centuries, but did not have editions designed specifically for them. By the 19th century, however, publishers produced elaborate gift editions, such as Henry Noel Humphreys’s Sentiments and Similes of William Shakespeare with its papier-mâché binding, meant to appeal to women–or to those buying them books. The decorative binding, which looks nothing like that of a 17th-century English book, also speaks to the intense interest the Victorians had in the culture of Elizabethan England. By the late 18th century, publishers began to produce works specifically for children. Charles and Mary Lamb produced the first children’s edition of Shakespeare, featuring short, prose versions of the plays with illustrations. By the 1950s, comic book adaptations of Shakespeare appeared; the fact that the dueling Romeo and Tybalt appear on the cover of Romeo and Juliet suggests that the book was meant to appeal to boys. The first illustrated edition of Shakespeare’s works was published in 1709; only one illustration was included for each play. Over time, illustrated books became a central part of the experience of reading Shakespeare. Charles Knight’s 19th-century pictorial edition of Shakespeare contained nearly 1,000 illustrations. Knight copiously illustrated explanatory notes for each play, to help readers better understand the landscapes, historical figures, costumes, castles, objects, and flora and fauna mentioned in the plays. The German publisher Ernest Nister primarily published illustrated books for children. His elaborate 1888 edition of A Midsummer Night’s Dream, aimed at adults, is a rare exception. Featuring sepia and color illustrations as well as an intricately decorated binding with gilt lettering, it is a luxury book intended more for display than reading. Childcraft, which originated in the 1930s and is now published by World Book International, is a serial publication designed for children. In 1975, Childcraft published a volume called The Magic of Words, which includes a much-shortened version of A Midsummer Night’s Dream with artwork designed by Kinuko Craft. A Japanese-born painter and illustrator who studied at the School of the Art Institute of Chicago, Craft has also designed covers for editions of Shakespeare’s plays published by the Folger Shakespeare Library. Beginning in 1789, visitors to the Shakspeare Gallery in Pall Mall in London would have been surrounded by paintings of scenes from Shakespeare created by the most famous artists of the day. By 1802, when the gallery was completed, it displayed over 160 paintings. People could also purchase engraved prints or subscribe to an illustrated edition of Shakespeare’s works, making the gallery a distinctive mix of literature, art, and commerce. The gallery was the invention of John Boydell (1719-1804), a printseller, publisher, and politician. Boydell wanted to promote a school of British history painting and commissioned prominent artists including Joshua Reynolds, Angelica Kauffmann, Benjamin West, and Henry Fuseli to paint scenes from Shakespeare; he hired the finest engravers available to render the paintings into prints. Each year, Boydell also printed and sold a guide to his exhibition. The economic upheaval created by the Napoleonic Wars in Europe forced Boydell’s firm into bankruptcy. In 1803, Boydell announced a lottery to raise funds to pay his debts–the prize being the collection of gallery paintings. The winner, William Tassie, sold the paintings at auction in May 1805. Angelica Kauffman (1741-1807) began producing commissioned portraits in her teens, and traveled through Switzerland, Austria, and Italy with her artist father. In 1766, she moved to London, where she achieved fame as a portraitist. A foundation member of the Royal Academy in 1768, she was a close friend of its president, Sir Joshua Reynolds. Kauffman painted two scenes for the Boydell Gallery, from Two Gentlemen of Verona and Troilus and Cressida. Two Gentlemen of Verona, one of Shakespeare’s earliest plays, tells the story of two couples: Valentine and Silvia, and Proteus and Julia. After rejecting Julia, Proteus kidnaps Silvia, claiming that he is in love with her and threatening to force himself upon her. Valentine and Julia (disguised as a boy) follow them into the forest, where Silvia is saved and Proteus is castigated by his friend before realizing the error of his ways and reuniting with Julia. It is this scene (Act V, Scene 4, although incorrectly identified on the print as Scene 3) that Kauffman depicts, capturing the tension between the lovers just before the happy ending. Joshua Reynolds (1723-1792) was the leading portraitist of his day, the first president of the Royal Academy, a major art theorist, and perhaps the most important figure in the history of British painting. For the Boydell Gallery, Reynolds created a painting inspired by Macbeth (Act IV, Scene 1), including the three witches and their familiars as well as the ghosts of kings. He depicted Macbeth with his back to the viewer, his head in profile, facing the witches. The three apparitions–the armed head, the bloody child, and the child crowned, with a tree in its hand, which appear in the play at different times–are incorporated in the composition. From 1786 to 1792, the artist George Romney worked on designs for the Boydell Gallery. He did not contribute a scene from Shakespeare’s plays, instead producing The Infant Shakespeare Attended by Nature and the Passions. Romney also attempted a painting of Prospero and Miranda from The Tempest, but it was unsuccessful, preventing him from receiving a commission for one based on Macbeth. Nevertheless, Romney made a number of sketches; he was particularly interested in supernatural subjects, and turned his attentions to the witches of the play. This rapidly executed drawing is characteristic of Romney’s method of working and exploring his creative ideas on a subject. While the sketch is minimalistic, its bold contrasts of highlight and shadow capture the dramatic atmosphere and convey movement and energy. Intending to illustrate Act IV, Scene 1, with witches chanting around a bubbling cauldron, Romney has left much to the viewer’s imagination: the figure to the left of the cauldron has alternately been identified by scholars as Macbeth and Hecate, one of the witches. Others have suggested that the curving vertical figure in the left foreground is Macbeth, watching and recoiling at the scene in front of him. The popular caricaturist James Gillray was rejected as an engraver by Boydell, causing Gillray to take his revenge in print. He mocked history paintings with his rendition of Hamlet’s soliloquy; and after a vandal damaged several paintings in the Boydell Gallery, Gillray claimed in his print, The Monster broke loose, or a peep into the Shakespeare Gallery, that it was only a publicity stunt. His particularly biting satire, Shakespeare Sacrified; or, The Offering to Avarice, casts Boydell as Prospero burning his books. Out of the smoke appear characters from gallery paintings, including Bottom, Puck, Lear, and the dead Cordelia. On the lower right-hand side, Hamlet’s grave-digger indicates the gallery’s grave. Music was integral to Shakespeare’s own creative production and has continued to be prominent in Shakespearean imaginations in the years since his death. Although musical references appear in every Shakespeare play, no instrumental music survives that can be associated for certain with a production during Shakespeare’s lifetime, and musical information from the stage directions and play texts is often unclear. Since the late 17th century, composers have interpreted Shakespeare creatively through their scores for the plays and have also turned to him as an inspiration for their own works. Mendelssohn’s incidental music for A Midsummer Night’s Dream (which he completed in 1842, after writing the Overture in 1826) was one of the earliest pieces of descriptive music specifically intended for concert, and proved enormously popular. Falstaff was Giuseppe Verdi’s last opera, and one of three (including Macbeth and Otello) that he wrote based on Shakespeare, with a libretto by Arrigo Boito derived from The Merry Wives of Windsor. First performed in 1893, the opera did not meet with success until Arturo Toscanini revived it in the early 20th century. 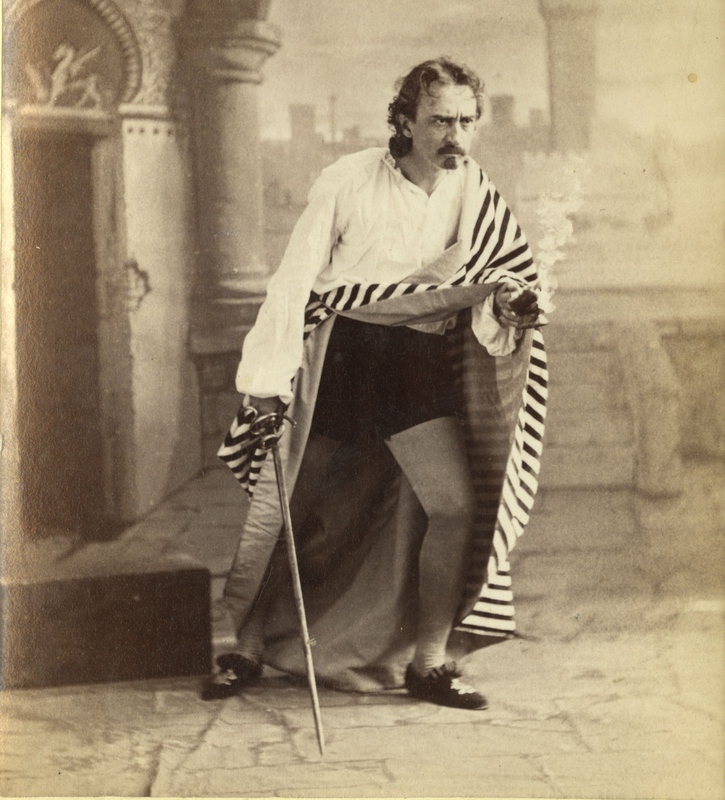 In the 19th and 20th centuries, musical Shakespeare was not limited to the opera or concert hall, but could also be found in homes as part of everyday entertainment: the musically inclined could buy collections of Shakespeare songs and ballads, as well as of Shakespeare-related sheet music for traditional as well as novel songs. There is sheet music ranging from A Midsummer Night’s Dream waltzes to an As You Like It polka to Hamlet’s soliloquy for a baritone voice.